This is part of the series, Making Things With Makers About Making. You can read the introduction to the project, and see other items in the series. I am making a thesis and what I’ve worked out is that when I make things to go with it, the ideas flow better. This is the methodology chapter. I’m thinking about reflexivity, agency and identity. 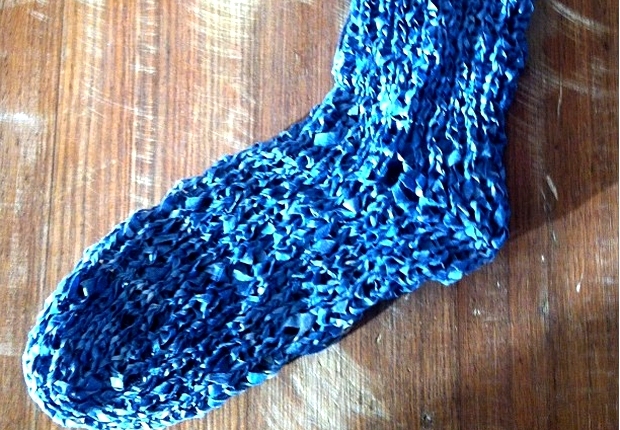 I made a hand dyed knitted paper sock to think about making texts. The process is in my Instagram feed. I am writing it into a scholarly article. The other thing I seem to be making is a digital identity, also currently being written up with colleagues. Currently I am experimenting with dyeing rice paper and knitting it into wearable–unwearable clothing. I’m trying to work through the notion of doing ‘uncomfortable reflexivity’ as a researcher. I am making objects of clothing that are comforting, as a habitus of practice in the activity of research by producing academic texts. I am working with indigo dyed materials and paper to consider the cultural and historical connotations of the use of the dyestuff. I am examining cultural assumptions and expectations in my artwork and investigating a particular way a cultural artefact like indigo has been used historically. The sock is about my comfort and discomfort in doing the activities of research. I like to write with socks and shoes on. Thank you to Megan for sending this in. Next you might like to look at other items in the series. What a fantastic statement of the presentation of self! And because a sock is knitted by conforming to the somewhat counter-intuitive rules of shaping which come together at the last possible moment, it couldn’t be a more fitting metaphor for methodology. Well and beautifully done.